Assistant Professor Shreepad Joglekar’s two national solo exhibitions opened in January 2017. 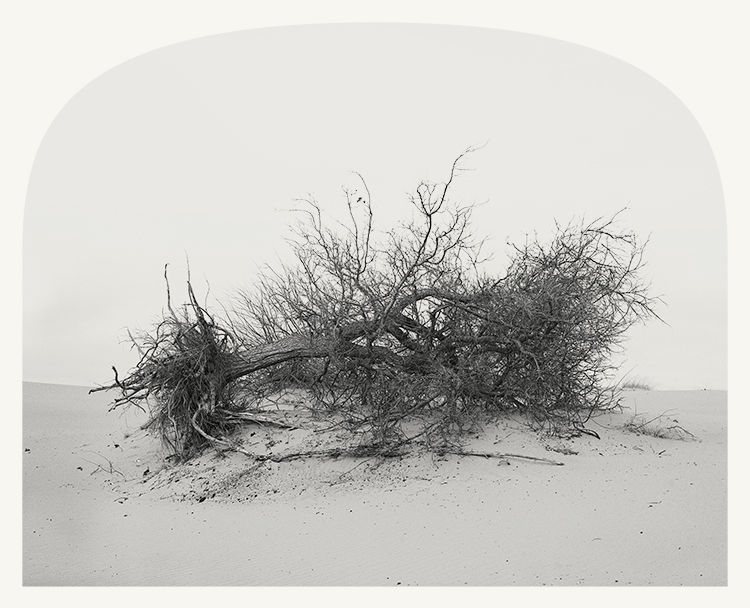 “Towards An Outer Place” opened in the James May Gallery in Algoma, Wisconsin and “Heterotopia” opened in the Bertha VB Lederer Gallery at the State University of New York (SUNY) in Geneseo, New York. These exhibitions included works from two projects that Joglekar has developed in the past three years. One of the projects, called Landscapes For Fun, focuses on off road vehicle parks in Kansas, Oklahoma, and New Mexico. The images in this project are made in the tradition of 19th century survey photography. The other project, called Non Places of Intelligence, explores the simulated environments used in military and law-enforcement training at Fort Riley post. 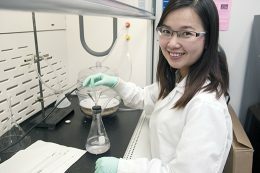 Tuyen Nguyen, doctoral student in chemistry, hopes a new method she is developing may treat bone cancer faster than chemotherapy. It also could partner with MRI scanning to diagnose cancer more effectively. Nguyen said she has synthesized nanoparticles, which are a million times smaller than a tennis ball, to sniff out villainous cancer and attack bone tumors head-on. Additionally, the nanoparticles light up cancer in MRIs to streamline diagnosis. “It’s exciting that this research could someday help chemotherapy patients in the fight against cancer,” said Nguyen, whose research is conducted in and supported by the Nanotechnology Innovation Center of Kansas State, or NICKS. Read the full story here. Sarah Riforgiate, associate professor of communication studies, traveled to Norman, Oklahoma, Feb. 24 to be the keynote speaker at the University of Oklahoma’s Department of Communication Showcase Seminar. 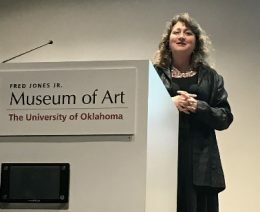 Riforgiate gave the keynote address “The Intersection of Paid Work and Private Life” about her ongoing research on domestic labor issues and the division of labor in the home. Later in the seminar, she gave a talk to students and faculty on navigating the process of promotion and tenure in academia. Natalie Pennington, assistant professor of communication studies, recently published research that provides insight into the perception of social support provided by social networking sites when a loved one has passed away. Pennington’s article, titled “Tie Strength and Time: Mourning on Social Networking Sites,” was published in the Journal of Broadcasting and Electronic Media. In the article, Pennington argues that two factors influence how supportive we can find the presence of social media: time spent online and how close we were to the deceased. The quantitative analysis, conducted in spring 2016 at K-State, suggests that those who use social media more find it more helpful as they process grief. For college students in particular, Pennington argues, having access to a site like Facebook can be useful when dealing with grief. 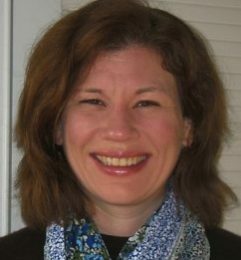 Her research argues that having a place online to turn to long after the funeral can serve a crucial role for support. The study also revealed an interesting relationship when it came to close relationships: while those who were closed to the deceased found support from the page, they were also more likely to want the page removed from Facebook. 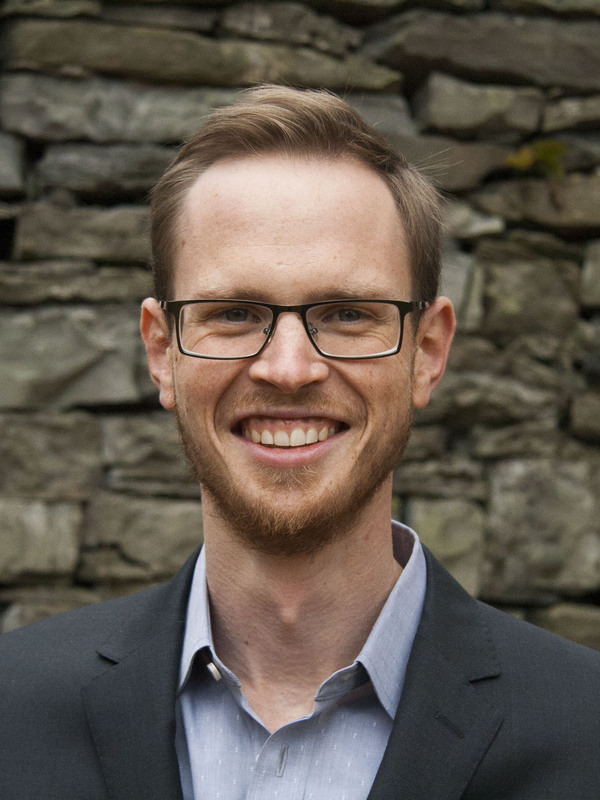 Professor of Economics Dan Kuester wrote an article for Wallethub.com, along with other economists and autors in related disciplines about the topic “Will Mexico Pay for the Wall?” Many of these articles are cited on CNBC or U.S. News and World Report, Kuester said. 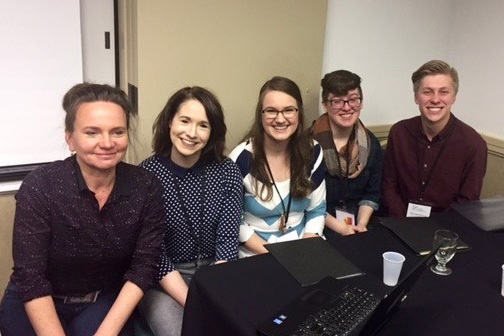 Assistant Professor Steffi Dippold and undergraduate students Hunter Nelson (BA ‘19), Sarah Peterson (BA ‘17), Malorie Wagner (BA ‘18), and Cheyenne White (BA ‘18) presented “Reading Kansas: Finding Early America in Local Special Collections” at the 10th Biennial Conference of the Society of Early Americanists in Tulsa. 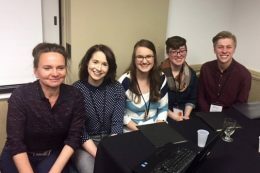 Their joint presentation shared the process and results from the digital humanities project “Reading Kansas: Hidden Histories of Midwestern Book Culture” completed as part of the Honors seminar course ENGL 399 “The Power of the Page: Books That Made Us” (Fall 2016). Peterson, Wagner, and White received Arts and Sciences Undergraduate Research Travel awards to attend the conference and present their work. 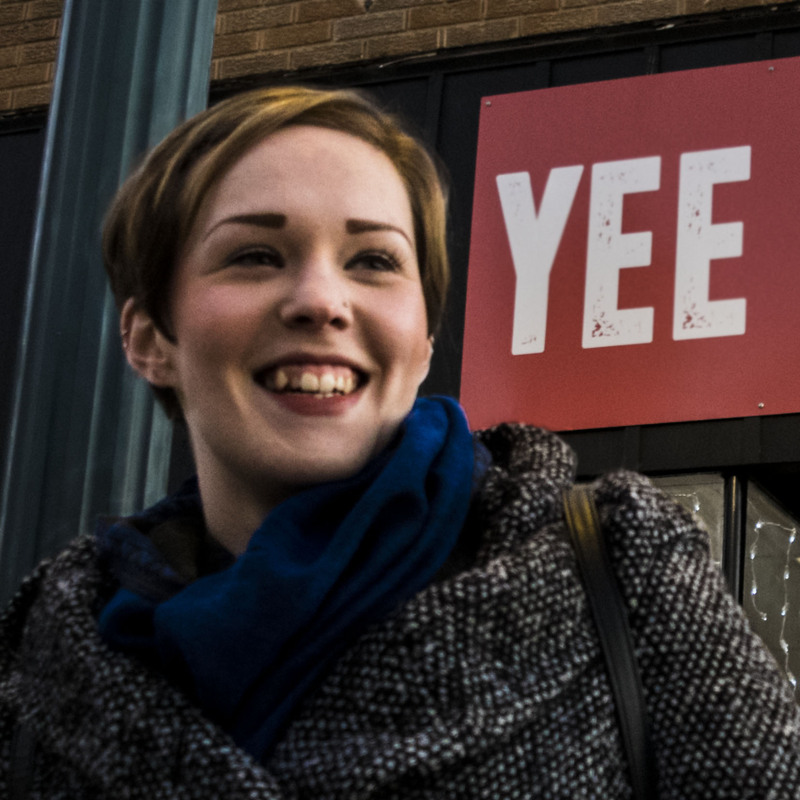 GWSS graduate certificate student Noelle Lynn Blood was awarded a top paper prize in the Popular Culture Interest Group at the Central States Communication Association Conference in Minneapolis. Blood’s paper, titled “A Barbie for Every Body? The Barbie Fashionistas as a Simulacrum of Real Beauty,” is an intersectional feminist critique of the newer doll line. Kendra K. McLauchlan, associate professor, gave an invited presentation titled “Reconstructing Nutrient Cycling in the Paleorecord to Assess Current Climate Changes” as part of the Women, Ecology, and Conservation in a Changing World seminar series at the University of Tennessee. 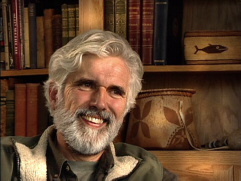 The lecture series is funded by the University of Tennessee Haines-Morris Endowment in the Department of Ecology and Evolutionary Biology and the Department of Geography. McLauchlan’s work examines nutrient cycles on a global scale by looking at paleorecords ranging in duration from tens to thousands of years. The College of Arts and Sciences supported the purchase of an Augmented Reality (AR) Sandbox for the Department of Geology through a large equipment grant. The AR Sandbox allows users to create topographic models by shaping real sand, which is then augmented in real time by a 3D visualization of an elevated color map projected onto the sand; the projection includes topographic contour lines and simulated surface water and precipitation. Students are able to interact with the sandbox and see immediately how different topographies would appear on a map as we ll as how those differences would affect the movement of water through a landscape or how differences in precipitation might affect that landscape. This state-of-the-art equipment will greatly enhance the instructional environment for nearly all geology courses, but particularly introductory geology courses such as GEOL 100 (Earth in Action), GEOL 103 (Introductory Geology Laboratory), GEOL 115 (Environmental Geology) and GEOL 125 (Natural Disasters). 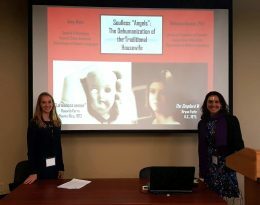 Rebecca Bender, assistant professor of Spanish, attended the 4th Annual Gender and Sexuality in Kansas Conference at Wichita State University with undergraduate Spanish major Amy Hein. 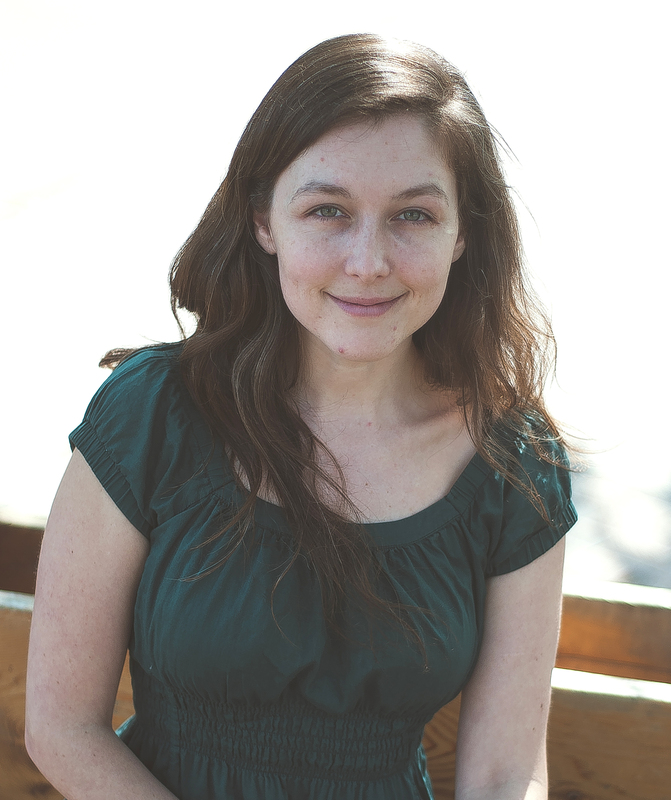 Amy took Dr. Bender’s Spanish 565, Introduction to Spanish American Literature course in Spring 2016. In Fall 2016, she worked to translate her seminar paper to English, and together they revised and expanded the cultural analysis. 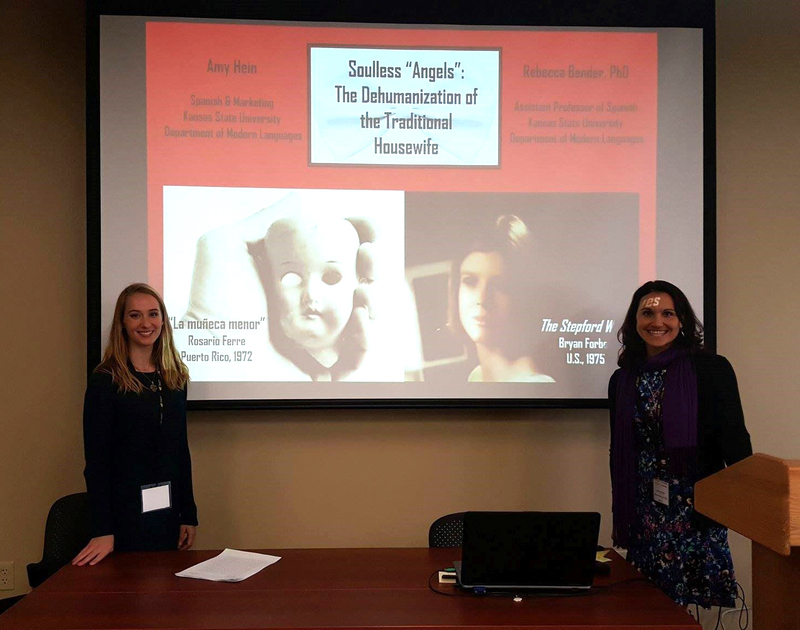 They co-presented the revised and extended paper, titled “Soulless Angels: The Dehumanization of the Traditional Housewife in ‘La muñeca menor’ and The Stepford Wives” at the conference. 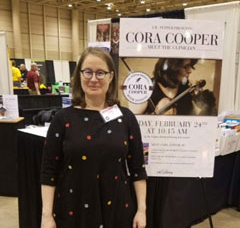 Cora Cooper, professor of music, was honored by the Kansas chapter of American String Teachers Association Feb. 24 at the state music teacher’s convention. Citing her work promoting music by women composers, she was presented with this year’s Certificate of Merit. Cooper has compiled and edited a four-volume graded anthology, “Violin Music by Women,” which seeks to make performing editions of these compositions accessible to teachers and students at every stage of development. She has also completed the first two volumes of a sister anthology, “Viola Music by Women.” Both are published by Sleepy Puppy Press. “Students and teachers have reacted very positively to the music,” Cooper said. 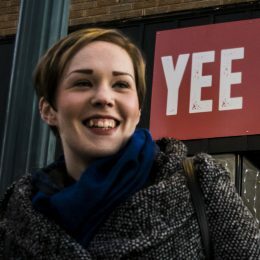 “It is a great way to build inclusivity into a repertoire almost entirely composed by men, played by a population that is more than 50 percent female.” Read more here. Professor of Philosophy Rosa Terlazzo won a grant to study “Transformative Experiences in Education.” The award is sponsored by the Spencer Foundation through the Center for Ethics and Education at the University of Wisconsin. Transformative experiences change who we are as persons because they change our fundamental values and aims. Because of this, such experiences can change what’s in our best interests. This connection to our well-being raises a host of questions: How can we properly choose which transformative experiences to undergo, or to offer to our children? Which values should inform our judgment? These questions are not merely academic: education consistently and unavoidably subjects children and young adults to transformative experiences, and some types of education (religious, military and Montessori schools, for example) explicitly aim for specific and far-reaching kinds of transformations. To what extent should public education aim to facilitate specific transformative experiences? And when it does so, which experiences should it encourage? Terlazzo’s work attempts to formulate principled answers to these questions by appealing to the aims of public education and novel theories of well-being. The work funded by this grant is part of a larger project devoted to the implications of adaptive preferences for moral theory and public policy. 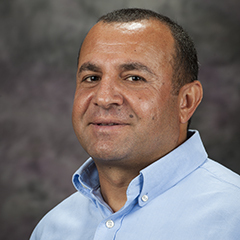 Sabri Ciftci, associate professor of political science, is a 2017 award recipient of a Project Launch Grant and a Curriculum Development Grant from the Global Religion Research Initiative, or GRRI. The initiative offers six types of grants to scholars who are integrating religion into academic research, theory and teaching. The nearly $10,000 Project Launch Grant will allow Ciftci to pursue his project, “Seeking Justice from Cairo to Istanbul: Islam, Social Justice and Democracy in the Middle East.” The project will investigate how religion informs social justice views and governance models in the Middle East. Ciftci is one of 15 award recipients in North America. Read the full story here. An award to support students as they explore the world has been established in honor of retiring University Distinguished Professor of Anthropology Harald Prins and his wife Bunny McBride. At least one student will be awarded up to $5,000 this summer to travel anywhere in the world. Over the coming years, the founders of the program, Michael Wesch and Ryan Klataske, hope to expand the program to support as many as 10 students who want to travel abroad. Read more about the new award here. Associate Professor of Social Work Don L. Kurtz was accepted into the Bureau of Justice Assistance (BJA) Smart Suite Researcher Practitioner Fellows Academy in Denver. The program, which ran from Feb. 7-10, is designed to bring more science to the fields of criminal justice and criminology. Kurtz’s position in the academy was fully funded by the International Association of Directors of Law Enforcement Standards and Training (IADLEST) as part of his continued involvement in the Blue Courage police research program. It’s so wonde full to see what people are doing on our Wildcat campus!!! What are the Christians up to on campus? You’ve covered extensively what the left-wing is pushing, have all the conservatives left since I graduated? The last 2 or 3 newsletters have not had anything from the History Dept. Was just curious as to why that is. We publish what the departments submit to us for features. I’ve let the History Department know that our alums want to hear from them! Thanks for reaching out.